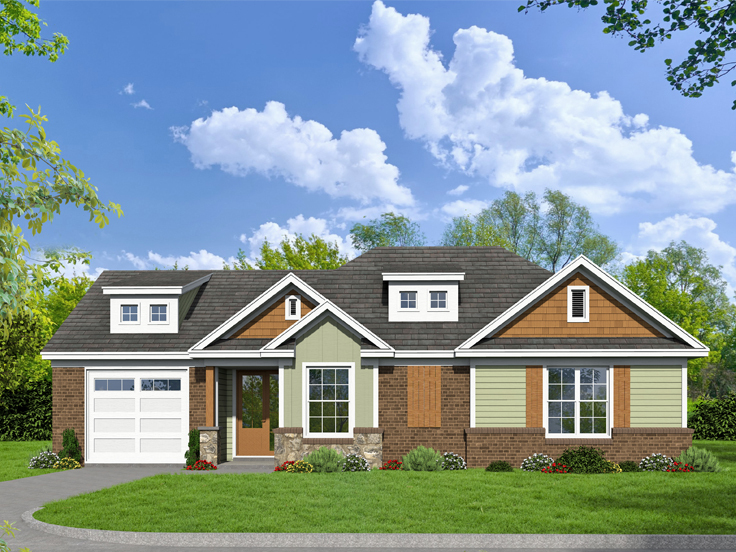 The House Plan Shop Blog » Now Featuring Some of Our Newest House Plans! Now Featuring Some of Our Newest House Plans! The House Plan Shop is currently featuring some of our newest house plans. We continuously add new house plans and multi-family plans to our website, so we are taking this opportunity to feature some of the new house plans that were added tour website within the last six months. These plans range in size and architectural style from tiny homes to luxurious Mediterranean home designs and everything in between. Take some time to review these six new house plans. 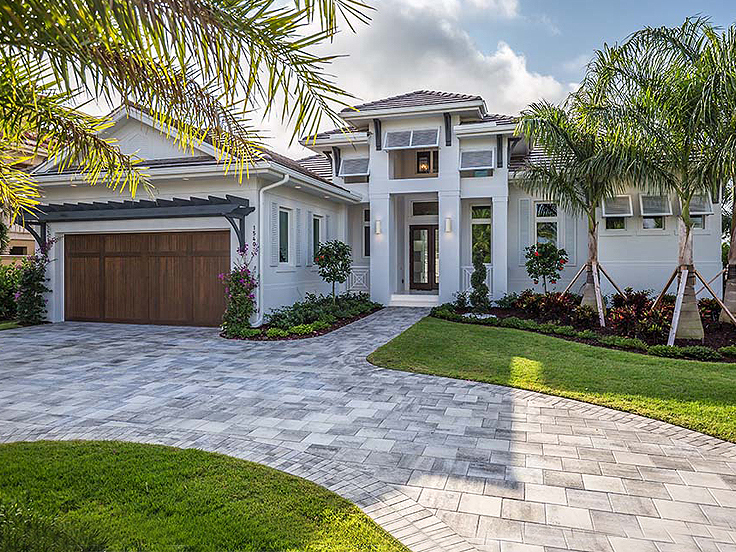 069H-0034 – Cool, yet grand relaxation, is generated by this one-story coastal house plan. An open floor plan leads one through the grandeur of volume ceilings to a wall of glass, and beyond to the outdoor living room under the covered lanai. Step back inside to grab a snack at the spacious kitchen food bar or warm yourself on a chilly evening at the great room’s homey fireplace. A split floor plan has the master of the house in mind with the voluminous master suite on one side of this design and the secondary bedrooms on the other. Treat yourself with twin walk-in closets, access to the lanai, and a deluxe master bath fit for royalty. After a dip in the pool, a soak in the tub, and a good night’s sleep, you won’t even care about that lost shaker of salt. 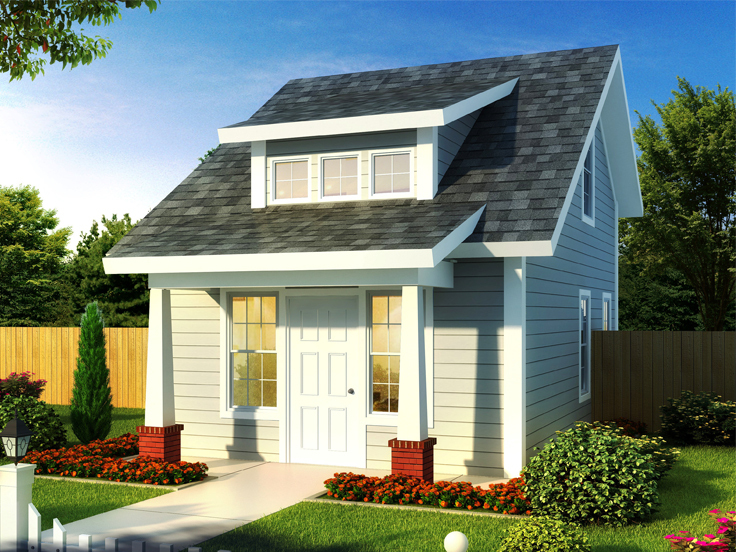 019H-0192 – This small, Craftsman house plan is nothing short of amazing. It has an endearing front façade highlighted with windows, a covered front porch with decorative columns, a shed dormer and gable bracing. Inside, you’ll find a spacious open floor plan topped with volume ceilings. Storage is king with walk-in closets for all the bedrooms, a walk-in pantry for the kitchen, a coat closet in the foyer and even a storage closet in the two-car garage. The covered terrace offers a place to relax outdoors. Ideal as a starter home, this one-story Craftsman house plan has more to offer than you might expect! 059H-0219 – Here’s a tiny house plan packed full of efficiency and covered with an attractive exterior. Enter through the front door and be amazed by the sense of spaciousness as the living room opens to the windows above. There is plenty of room to eat with a kitchen snack bar and a dinette. Capture a bit of privacy or pay bills online with the study alcove under the stairs. Take care of the laundry with a space-saving stacked washer/dryer in the utility closet. Enjoy a good night’s sleep in the second-floor master bedroom, complete with a walk-in closet. If you are looking to downsize, change to a minimalist lifestyle, or maybe build a cozy vacation home, this tiny house plan is worth taking a closer look. 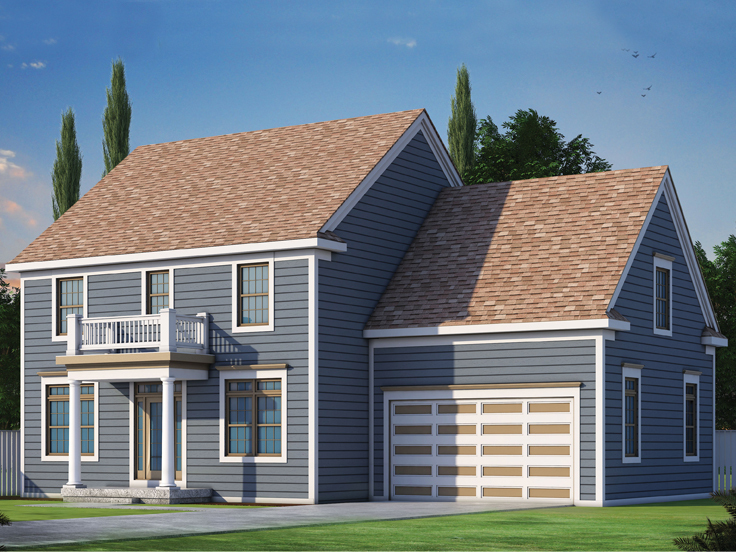 046H-0150 – A double door entry invites you into this two-story house plan. With its family-style open floor plan, Mom and Dad can keep an eye on the kids from the kitchen, dining room or great room. When need be, the study offers private quietude, plus the master bedroom resides on the first floor and the rest of the bedrooms are located upstairs. Show off the great room to guests with its volume ceiling and cozy fireplace. Step outside on the covered back porch to enjoy the outdoors protected from the sun. Conveniently located first floor laundry keeps the families clothes clean and walk-in closets keep them stored. Carefully designed for family living, you can’t go wrong with this two-story house plan. 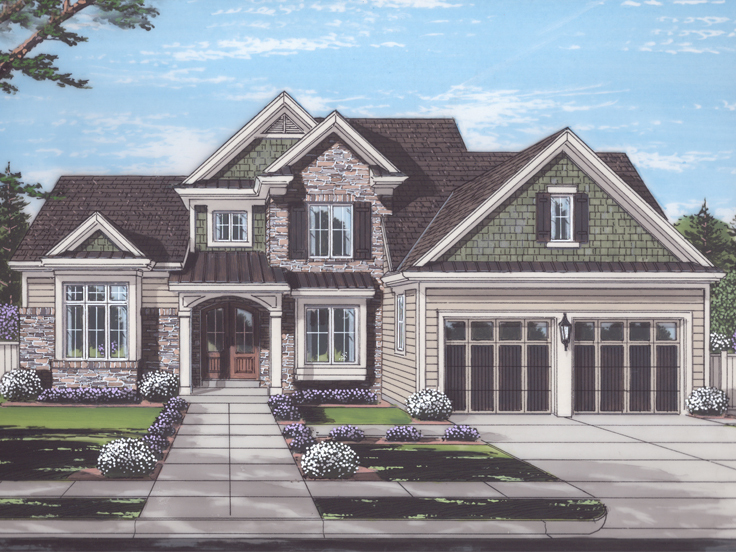 031H-0274 – Decorative columns support the front porch roof of this stalwart Colonial house plan. Family oriented, the open floor plan emphasizes the family center as the focus of the first level. Whether watching television, warming cold toes at the fireplace, or eating at the kitchen snack bar, family remains connected. When day is done, everyone retires to the second floor where all the bedrooms are located. There is a bonus room over the garage that gives you room to grow. Perhaps it will be another bedroom, playroom, or a hobby room. Planning your vision is sure to be a great family collaboration with this two-story house plan. 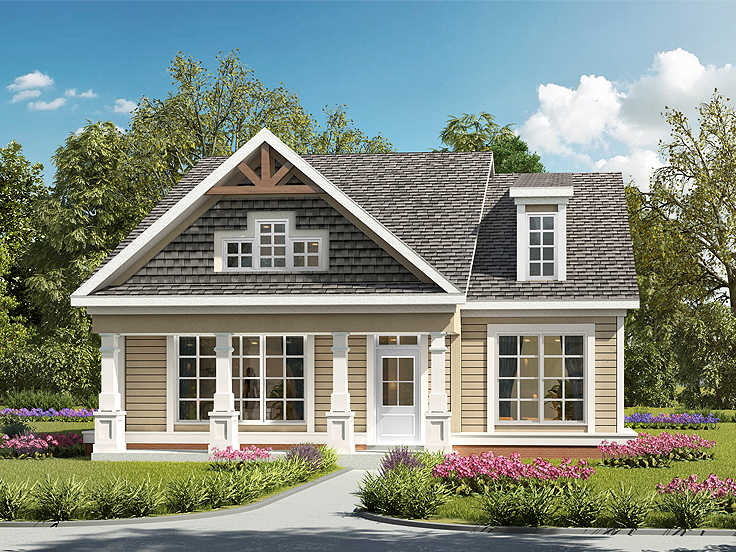 062H-0112 – Fashioned with shed dormers and a multi-material façade, this Craftsman ranch house plan will spark visual interest in any neighborhood. Inside, the floor plan delivers practical elements and special amenities that are sure to enhance family living. The kitchen features a snack bar and a walk-in pantry for extra storage, while both bedrooms boast walk-in closets and easy bath access. The garage offers storage space too! A corner fireplace in the family room lends a homey feeling to this open floor plan, and the easy-to-access laundry room makes light work of weekend chores. Whether you are a new family just starting out or an empty-nester streamlining your life, this is an attractive and well-balanced house plan. We continuously add new house plans to our website. Check back often to discover more new house plans like these! What’s Hot? Modern House Plans!